Power BI Pro 是单个许可证，允许访问 Power BI 服务中的所有内容和功能，包括共享内容以及与其他 Pro 用户协作的功能。Power BI Pro is an individual license that allows access to all content and capabilities in the Power BI service, including the ability to share content and collaborate with other Pro users. 只有 Pro 用户可以将内容发布到应用工作区，使用这些内容，共享仪表板并订阅仪表板及报表。Only Pro users can publish to and consume content from app workspaces, share dashboards, and subscribe to dashboards and reports. 有关详细信息，请参阅按许可证类型划分的 Power BI 功能。For more information, see Power BI features by license type. 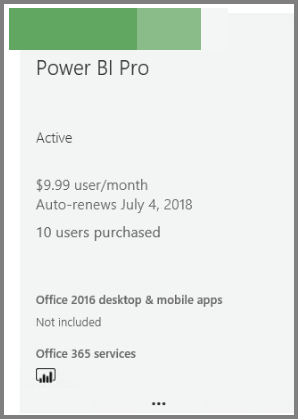 本文首先介绍了如何在 Office 365 中购买 Power BI Pro 许可证。This article first explains how to purchase Power BI Pro licenses in Office 365. 接着说明了可用于将这些许可证分配给各个用户的两个选项：Office 365 和 Azure（选择一个选项）。The article then explains the two options you have for assigning those licenses to individual users: Office 365 and Azure (choose one option). 你必须是 Office 365 中全局管理员或帐务管理员角色的成员。You must be a member of the Global administrator or Billing administrator role in Office 365. 要在 Azure 中分配许可证，则必须是 Power BI 用于 Active Directory 查找的 Azure 订阅的所有者。To assign licenses in Azure, you must be an owner of the Azure subscription that Power BI uses for Active Directory lookups. 打开 MIcrosoft 365 管理中心。Open the Microsoft 365 admin center. 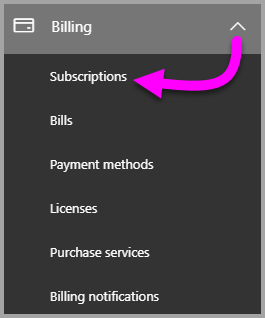 在左侧导航窗格中，选择计帐 > 订阅。On the left navigation pane, select Billing > Subscriptions. 在“订阅”页面的右上角，选择“添加订阅”。In the upper right corner of the Subscriptions page, select Add subscriptions. 在“企业套件”下选择“Office 365 企业版 E5”。Under Enterprise Suite, select Office 365 Enterprise E5. 在“其他计划”下选择“Power BI Pro”。Under Other Plans, select Power BI Pro. 将鼠标悬停在所需订阅的省略号 (. . .) 处，选择“立即购买”。Hover over the ellipsis (. . .) for the desired subscription, and select Buy now. 根据你的计费偏好，选择“按月付费”或“按年付费”。Choose Pay monthly or Pay for a full year, according to your billing preference. 在“需要多少个用户?”下，输入所需的许可证数量，然后选择“立即签出”完成此交易。Under How many users do you want? enter the desired number of licenses, and then select Check out now to complete the transaction. 验证获取的订阅是否已在“订阅”页面上列出。Verify that the acquired subscription is now listed on the Subscriptions page. 若要在最初购买后添加更多许可证，请从“订阅”页面中选择“Power BI Pro”，然后选择“添加/删除许可证”。To add more licenses after the initial purchase, select Power BI Pro from the Subscriptions page, and then select Add/Remove licenses. 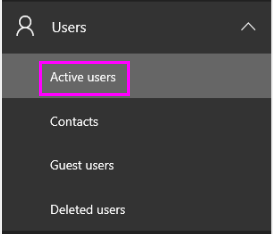 在左侧导航窗格中，展开“用户”，然后选择“活动用户”。On the left navigation pane, expand Users, and then select Active users. 选择一个用户，然后在“产品许可证”下选择“编辑”。Select a user, then under Product licenses select Edit. 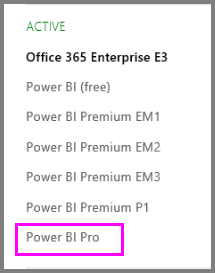 在“Power BI Pro”下将设置切换为“开”，然后选择“保存”。Under Power BI Pro, toggle the setting to On, then select Save. 根据所选帐户的状态，验证 Power BI Pro 许可证是否成功分配。Under Status for the selected account, verify that the Power BI Pro license has been assigned successfully. 打开 Azure 门户。Open the Azure portal. 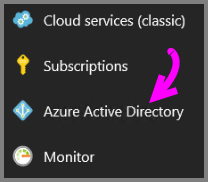 在左侧导航栏中，选择“Azure Active Directory”。In the left navigation bar, select Azure Active Directory. 在“Azure Active Directory”下，选择“许可证”。Under Azure Active Directory, select Licenses. 在“许可证”下，选择“所有产品”，然后选择“Power BI Pro”以显示许可用户列表。Under Licenses, select All products then select Power BI Pro to display the list of licensed users. 选择“分配”将 Power BI Pro 许可证添加到其他用户帐户。Select Assign to add a Power BI Pro license to an additional user account. 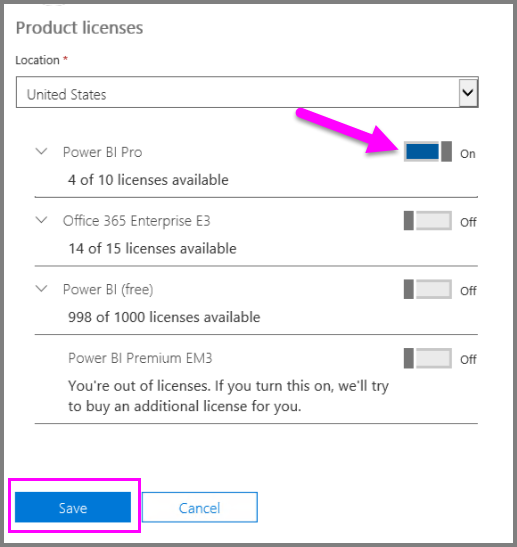 现已分配许可证，可以了解有关 Power BI Pro 的详细信息。Now that you've assigned licenses, learn more about Power BI Pro.